It's imperative that our racks and prewires be wired neatly. A clean installation saves time and money down the road. Although our equipment racks are often hidden behind closed doors, our technicians take great pride in every aspect of the installation. When wires are combed, colored coded, and labeled, the system can be manged easily. That means for service or upgrades, a technician won't have to wade through layers of confusing wire paths to access a particular piece of gear. 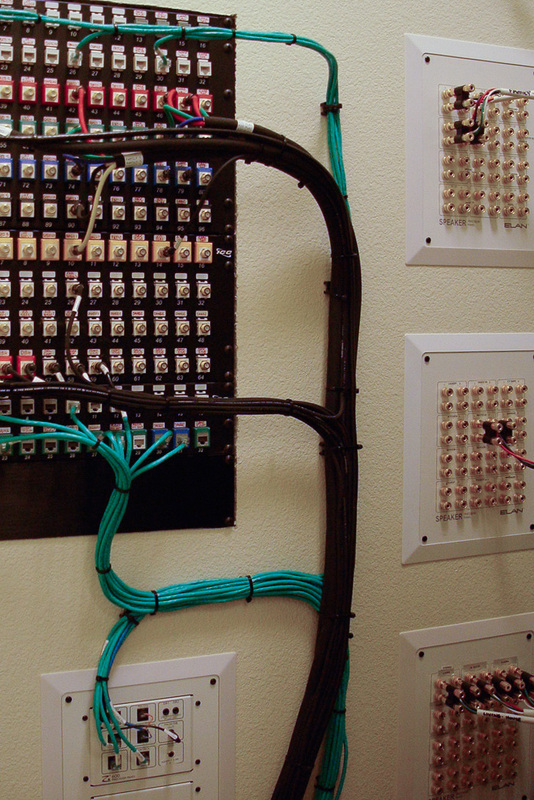 A high-quality prewire is a prerequisite of a high-end home technology system. 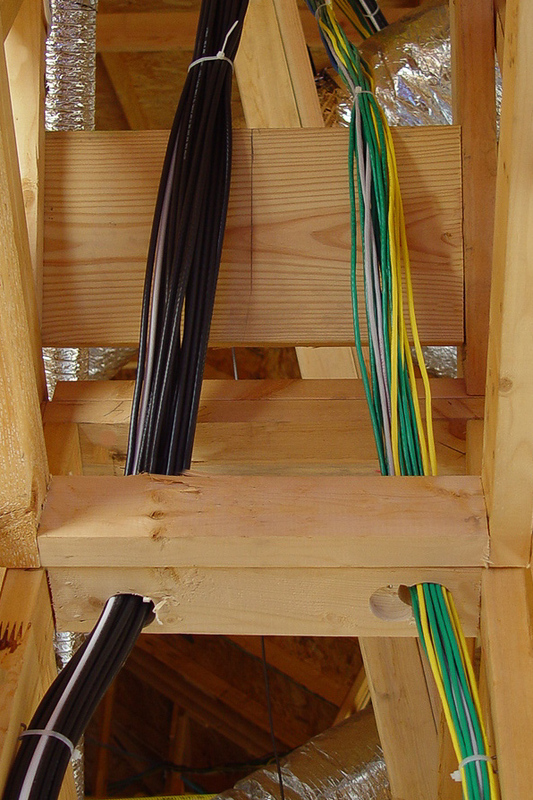 Wire must be up off the ceiling joists, run on its own supported pathways, out of the way of damage by others. It must be run apart from noise-producing equipment and other wiring that can cause signal disturbances. Doing a prewire properly doesn't take more space, but it will take more time. This client hired us to wire his new home for the future. We performed a future-proof prewire, and terminated all wires at this connection point. Wires are labeled and ready, but only a few are currently in use. This client was smart—he knew that getting the wires in the walls during construction would cost pennies on the dollar, when compared to waiting and retrofitting each time he was ready to add new technology. This panel makes it simple for us to add technology and make changes over time. Over the years, this client client has activated technology in previously dormant rooms as his family grew. Wire for later and activate for now. This 8-source, 9-zone Elan system is an example of the finished look of the racks we install. In this layout we have an extremely small space housing a very large, complex system. Because all of the wires are combed, colored coded, and labeled, the system can be managed easily. That means for service or upgrades, a technician won't have to wade through layers of confusing wire paths to access a particular piece of gear. 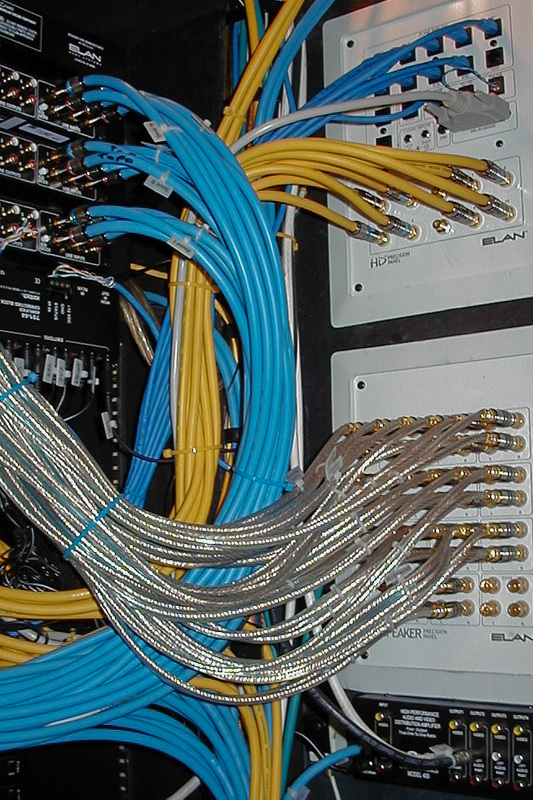 In this photo, the yellow wires represent all video including TVs, cameras, and video touchcreens. The large blue wires represent all audio, and the small blue wires are all the control points. The silver wires run to the speakers. It's very important for our racks to be wired neatly. This is the back of a cinema room equipment rack. This 7.1 channel audio system is dressed with the copper wires at the top. The rack is small, and there are an incredible number of signal pathways—but all of it is manageable by correctly combing, color coding and labeling the wires. This careful attention to detail allows for higher levels of gear performance, and realistic technology upgrades over time. Our techs are extremely proud of the work they perform, even when it's on a rack that's not visible on a daily basis. We created a "chase" away from the one the electrician was using, separating our audio and video from each other to prevent cross talk. Running wires like this also keeps them safe from the traffic of other trades, preventing damage to the wire over time. You can do it right, or it's wrong. There is no grey, or "kind of good" when it comes to a prewire. Just because a mediocre prewire works today doesn't mean it will work later. Thirty-foot wire runs that free-hang across an attic won't last long. Also, tight wire won't last. A proper prewire is key. Wire must be up off the ceiling joists, run on its own supported pathways, out of the way of damage by others. It must be run away from noise-producing equipment and other wiring that can cause signal disturbances. Doing a prewire properly doesn't take more space, but it can take more time. Done properly, the investment in a prewire will last a very long time.